"Three fires were burning at Camp Pendleton Marine Corps base on Friday, with the largest one prompting the evacuation of 750 homes — forcing evacuations of residents in DeLuz and O'Neill Heights housing areas", base officials said. The largest fire broke out around 11:30 a.m. By 6:50 p.m., it was 40 percent contained and had burned 350 acres. Online, the fire has the hashtag #vandegriftincident. Another fire popped up late in the afternoon, scorching at least 30 acres in an impact area in Range 409. A base spokesman said officials are monitoring that blaze. And in the north area of the base, a vegetation fire that had burned 50 acres was reported in the around 6 p.m. Basilone Road was shut down from 43 Area in the center of the base to the 52 Area to the north. San Diego Gas and Electric turned off power to about 920 customers on the base for safety at about 2:50 p.m., and power was expected to be out until 8 a.m. Saturday. Ground and air crews were on the scene to fight the first fire at about 4 p.m. People who were displaced from the evacuations were being sent to a McDonald’s on base. 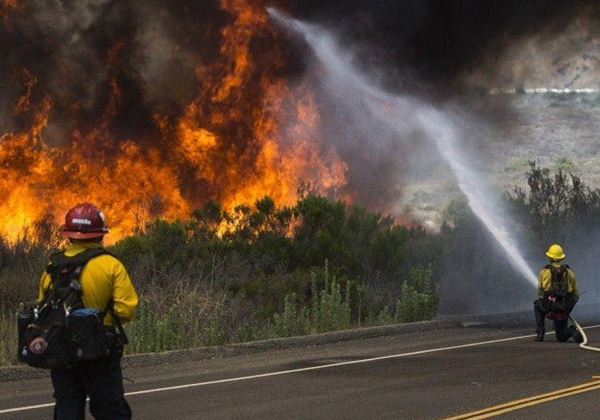 M-Fire Suppression has been calling the Marines for 2 months now, to set up a burn demo to show them how our Mighty Fire Breaker™ could be pre sprayed ahead of wild fires to eliminate its ability to advance with so much energy. Hoping someone can get to the base commander to set up a free demo burn on Camp Pendleton.